Britain does period, factual drama better than anyone else – often derived from its rich, varied and frequently traumatic past. Belle highlights a particularly unpleasant era during which prejudices and injustices were faced not just by black people before the abolition of slavery, but also more generally by women in Georgian England. Directed by Amma Asante, written by Misan Sagay, and featuring Gugu Mbatha-Raw, Emily Watson, and Tom Wilkinson, this film comes alive because those involved portray a sympathy in their roles which could only come from deep empathy with its core themes. A lesser known episode from the period of English history which led to the abolition of the slave trade, Belle recounts the true story of Dido Elizabeth Belle (Mbatha-Raw), the illegitimate mixed race daughter of an eighteenth century British naval officer, who is taken into the care of her great-uncle Lord Mansfield (Wilkinson), The Lord Chief Justice of England, and his wife (Watson). 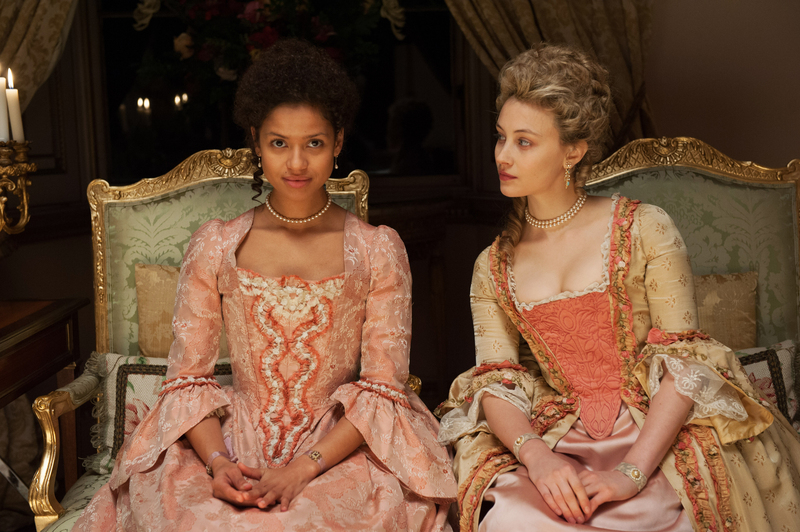 Afforded all the privileges of her lineage, Belle is nonetheless ostracised from society due to her colour. All this changes however with a court case over which Lord Mansfield presides, its outcome affecting not just the course of British law but also Belle’s future happiness. Occasionally a film, like Belle, still appears that restores your faith in an industry, the driving force of which seems to increasingly derive from populist culture and subject matters. These are films which, like the story they tell, have a sense of relevance which lends them a voice that transcends time. As with the recent 12 Years a Slave (2013) and Mandella: Long Walk to Freedom (2103), Belle is imbued with an empathy for its central character, clearly coming from the fact that those people involved in its production felt an affinity with the subject. Only Asante’s second film as director – after the BAFTA winning A Way of Life (2004) – here she steers the story with an accomplished lightness of touch, which belies her relative directorial inexperience, as she captures the serious air of writer Misan Sagay’s retelling of the story at the film’s heart with its sensitive subjects of racial and sexual inequality. Cast members like Watson and Wilkinson, along with Penelope Wilton and Miranda Richardson, are suitably aristocratic in roles similar to those around which they have built successful careers portraying. However it is Mbatha-Raw as Belle – in her wide eyed innocence of, and then frustration with, the cruelty and inequality of the society which she finds herself born into – who lends the story a believability which will move viewers to tears. Besides its political messages, it’s the film’s evocative recreation of eighteenth century England which stays in the mind. Shot on location at authentic historical locations, and with an eye to exquisite period detail, this is yet another film which proves why Britain still produces some of the film industry’s most talented and accomplished artisans, as well as evocative and beautiful pieces of cinema. Productions such as Belle are a continuing reminder of the darker facets of man’s past, and that film can still play a part in bringing it to light lest we should forget.